Evelina seemed to be in better spirits, perhaps because Oakes Angier returned from Boston. She was savoring every minute with him before he left for Cuba. Her sisters-in-law, Sarah Ames Witherell and Sarah Lothrop Ames, had also been in the city. They returned with the news that Caleb Norris, son-in-law of Robert and Melinda Orr, had given his wife, also named Melinda, a dressing case for her 28th birthday. Norris was a dry goods merchant and the young couple lived with her parents on Columbus Avenue. Given Norris’s connections in wholesale and retail, he must have been able to procure his wife a fine box, perhaps at a friendly price. However he managed it, he impressed the Ames women mightily. A dressing case was a fashionable item for women**, one that could be placed on a dressing table or clasped closed to travel. Most cases, such as the one in the illustration, contained bottles and vials to hold perfume and lotion, and brushes and combs for the grooming of increasingly complicated hairstyles. 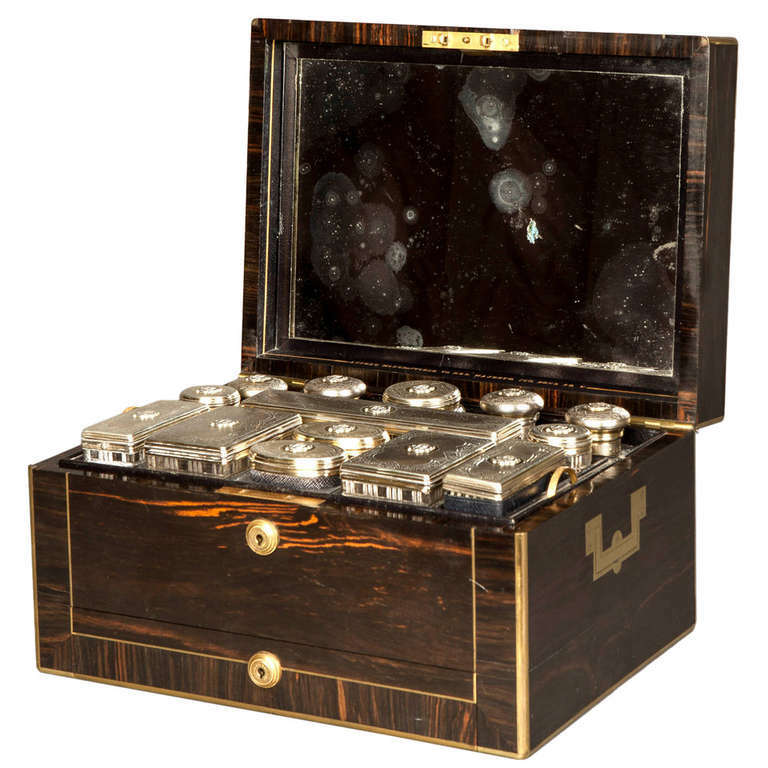 All items deemed necessary for the beautification and maintenance of a woman’s hair, face and hands were thoughtfully and expensively included, topped off in this case with silver lids. Their friends weren’t the only ones spending money on luxury items. Evelina tells us what it cost to buy some new flatware and have it monogrammed: $77.77. In today’s dollars (2015), that would amount to approximately $2,430. The Ameses were becoming quite wealthy to be able to spend that amount. The purchase certainly overpowers that 75 cent crumb brush that Evelina received from her nephew Fred, but to her credit she seemed equally pleased with both acquisitions. ** There were also dressing cases for men, with different contents, naturally.